Next Tuesday, the Colorado Department of Transportation's (CDOT) existing Bustang operation is expanding to serve the communities along U.S. 50 between Lamar and Pueblo. The new service, to be called Outrider, will provide the same bus service that Bustang offers in other parts of the state. Each coach equipped with restrooms, bike racks, free WiFi where available, power outlets and USB ports. Each Outrider coach has 38 seats and is handicap accessible. Outrider service will run once a day in each direction - Lamar to Pueblo in the morning; Pueblo to Lamar in the afternoon, Monday through Friday. Outrider will leave the Lamar Welcome Center at 7:10 a.m. and arrive at the Pueblo Transit Center at 10:15 a.m. It will leave Pueblo at 3:45 p.m. and arrive in Lamar at 6:48 p.m. A one-way trip between the two cities will cost $21. Other stops along the route include Fort Lyons, Las Animas, La Junta, Swink, Rocky Ford, Manzanola and Fowler. 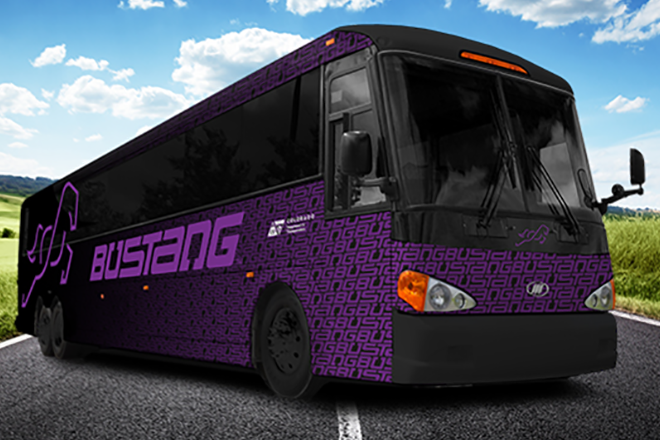 "When we launched Bustang, it introduced a new era in the state's transportation system. Now with Outrider, it marks another crucial step at creating the healthiest multi-modal transportation system in the country," said CDOT Executive Director Michael Lewis. "Linking the rural areas of the state will provide a vital service for those who need or want the amenities that larger communities provide." Bustang's current routes are between Colorado Springs and Denver, Fort Collins and Denver and Glenwood Springs and Denver. CDOT anticipates extending the Colorado Springs service to Pueblo later in 2018. Outrider is expected to expand its services in summer 2018 (tentative) between Alamosa and Pueblo, Gunnison and Denver and Durango and Grand Junction.